The nights before Christmas are a traditional time to tell ghost stories. Here is one about the spectre of a WW2 Nazi bomber pilot who is said to stalk the Sussex village where his plane crashed. I learnt about the tale from the book Ghost Hunter Walks in Sussex, which I've been using to explore haunted places in the county over the past couple of years. 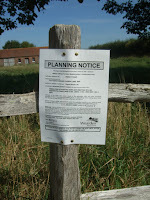 One of the walks goes through the tiny village of Ripe, near Michelham Priory. In 1940, during the Second World War, the skies above Sussex were filled with the aircraft fights of the Battle of Britain. One German bomber shot down by RAF pilots landed in a field on the edge of Ripe. The bodies of the crew were buried in the local churchyard and given a Christian service. However, one of the Nazis, it seems, did not rest peacefully in his grave. His ghost, dressed in a flying suit, leather helmet and goggles, has since been seen walking restlessly around the site of the crash. Following the directions in the book, I think I found the field in question. It seemed devoid of ghosts on the sunny day in early autumn when I did my walk. However, it's certainly not a field I would want to be walking through on the dark nights of winter. And, if you look at the photos I took, you will see that the land is probably not going to be an open field for much longer. 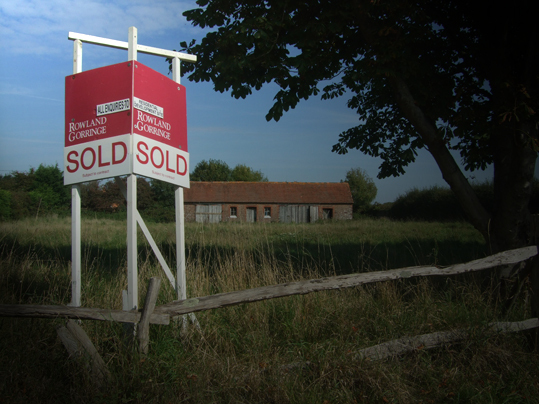 There was a big "Sold" notice at the edge and a planning notice stating that residential properties were going to be built on the site. Think about it - would you want to buy a home where you might just see the restless ghost of a Nazi pilot staring through your bedroom window on a dark night before Yule? You can view Ghost Hunter Walks in Sussex on Amazon.